Dallas Willard changed my understanding of the Christian life and gospel, for the better (and the more biblical). 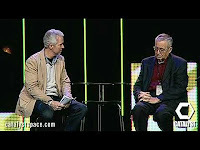 Watch John Ortberg interview him at the Catalyst West conference where I witnessed the audience gasp and burst into applause at a few of his pearls of wisdom. He speaks to young leaders about the need to clarify the central message of Jesus. Is it the announcement of the minimal entrance requirements for entering heaven...or something else? He also speaks about the role of grace and spiritual disciplines in the process of becoming like Jesus through spiritual formation.